Hong Kong’s story is one best told on screen, through dihn ying, electric shadows. For decades, it was one of the world’s film capitals, and it was through film that Hong Kong projected itself onto the world with action films and comedies that, beyond their mass appeal, explored the deeper corners of Hong Kong’s psyche. 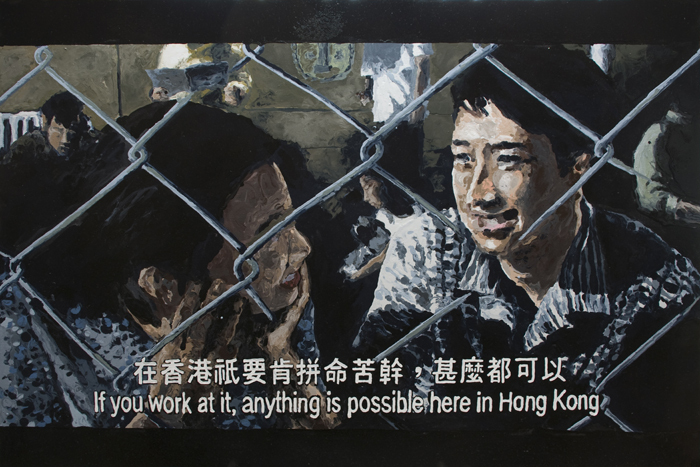 Since 2006, Chow Chun Fai, one of Hong Kong’s most interesting artists, has reproduced stills from more than 100 movies, complete with English and Chinese subtitles. 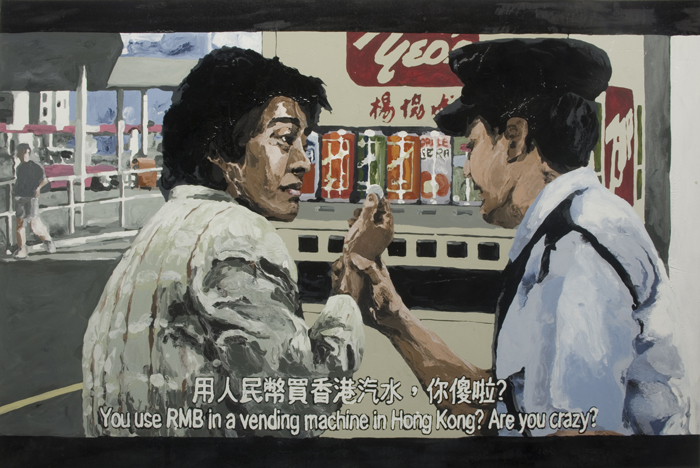 Each painting captures a small truth about Hong Kong’s culture and identity; together, they form a sweeping and surprisingly nuanced narrative of the city’s history from the 1970s to the present day. Earlier this summer, I paid a visit to Chow’s airy studio in Fotan, an industrial district in the New Territories. As I sat beneath his fastidiously-organized collection of books, Chow made me coffee and we talked about art, Hong Kong and a show in which he reproduced Vermeer’s “The Art of Painting.” What really interested me, though, was his film series. Below is a short and lightly edited excerpt from our hour-long conversation. 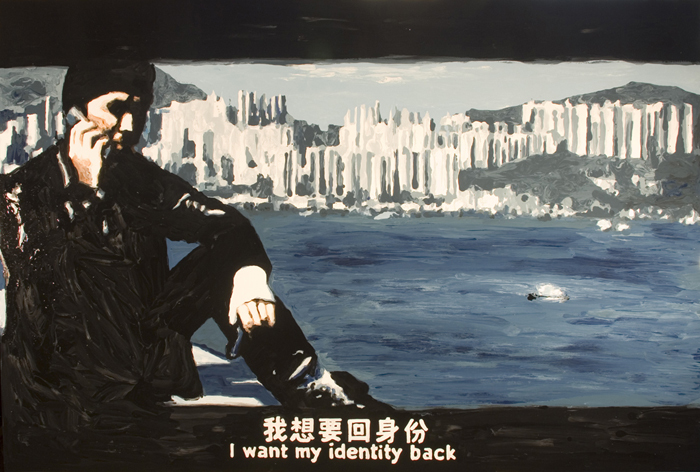 In the beginning, I tried to escape from my Hong Kong identity in my paintings. In those days, I even hated to show my “Hongkongness” or my Chineseness. Of course, as you can see, it shows through in every work, but in the past I didn’t want to tell others who I was — it was as if I was selling my identity. So that’s why I decided to start by painting some very normal things from my life. I painted pens, I painted clothes, plastic bags, instant noodles. 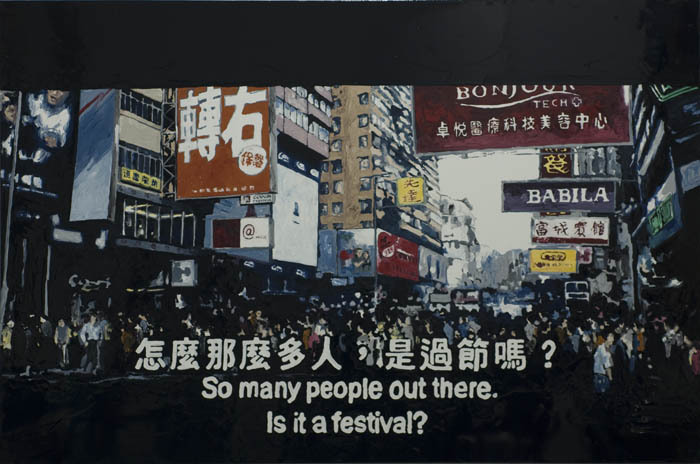 But when I paint from my life, or I paint the taxis and street scenes I see every day, it shows very clearly that I am from Hong Kong. It made me realize that I can’t escape from that. Those taxis in my paintings have a long story behind them. My father owned two taxis but he got sick, so for many years I took care of the taxis by myself, even though I was still studying. I didn’t know it would be so complicated to run a taxi — you have to have a licence, business registration, vehicle registration, radio registration, then you have the taxi maintenance and insurance, and of course you have to communicate with your taxi drivers. It’s a game of dice. I learned a lot from running those taxis that I didn’t from the art world. I learned about life from taxis. That’s why I have so many of them in my paintings. They’re a record of my daily life but they’re also icons of Hong Kong. After the daily life, the taxis and the street scenes, I changed focus. I realized I couldn’t escape from my identity and I even picked it up as my subject matter. For my series on film, I have many different paintings, but I see them all as one work. I do a lot of research on movies to see what I can find out from them. There were many movies in the 80s and 90s about Hong Kong and I have all of these images in my computer. Through them, I can see the whole development of Hong Kong. It’s not the real Hong Kong, but the story of how Hong Kong has changed through the eyes of different directors and people. In the 70s or 80s, there were more local Hong Kong issues in the movies. It’s when people started to ask who we are and what is the real identity of Hong Kong. The latest movies are often about Chinese history. Why? Because they want to have a wider market so they can sell their movies to the mainland and Taiwan. This is what all of Hong Kong is doing. 10 years before, 20 years before, people hated to go to the mainland, but now they’re very happy to do it. In many Hong Kong movies, there are characters that don’t have a real identity of their own, like in Infernal Affairs or in many kung fu movies. They’re fighting for their master but they don’t know who their master really is. I think this reflects society quite well. This entry was written by Christopher DeWolf , posted on Thursday September 10 2009at 10:09 am , filed under Art and Design, Asia Pacific, Film, Society and Culture and tagged Chow Chun Fai, Film, Hong Kong, Identity, Painting . Bookmark the permalink . Post a comment below or leave a trackback: Trackback URL.